Trains are today quite usual and ordinary way of transport. But two centuries ago, it was an exciting new spectacle bordering with magic. 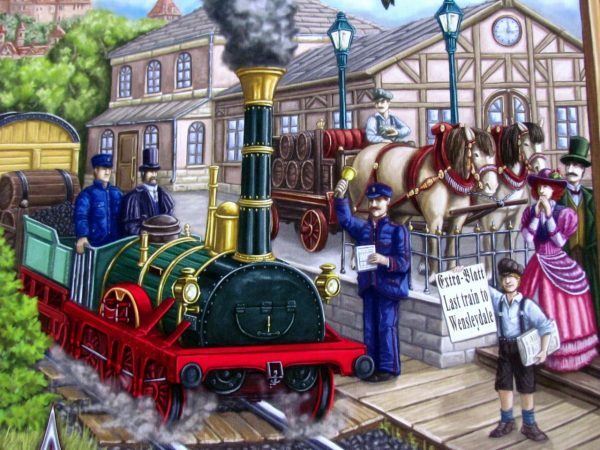 Huge many-tons-weighing giants were given force by steam, set into motion and many people admired their grace every day. But there were also those, who did not like this development. Mostly it were land owners, where railroad should lead. Even such ability to negotiate and give them something in return belongs to the development of any transport and ability to deal with it to basic features of each company headmaster. 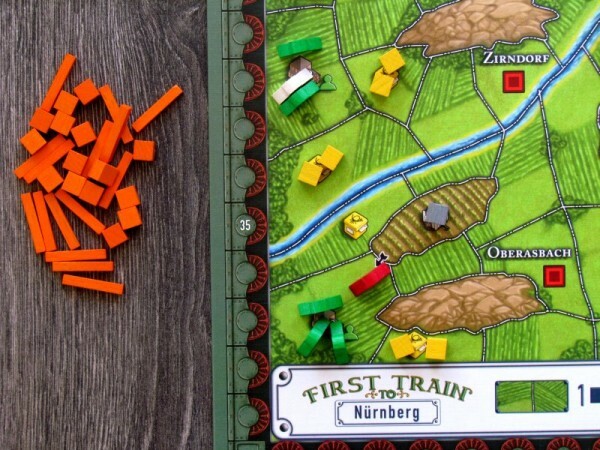 And those skills will be needed for all the players, who get tempted by a box called First Train to Nürnberg (Nuremberg). 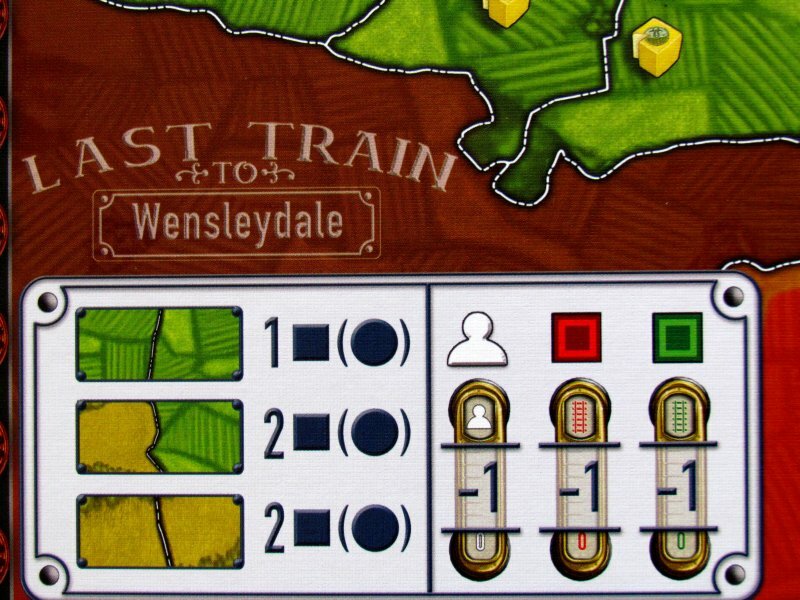 This is a new version of the game, which was released earlier under name First Train to Wensleydale. 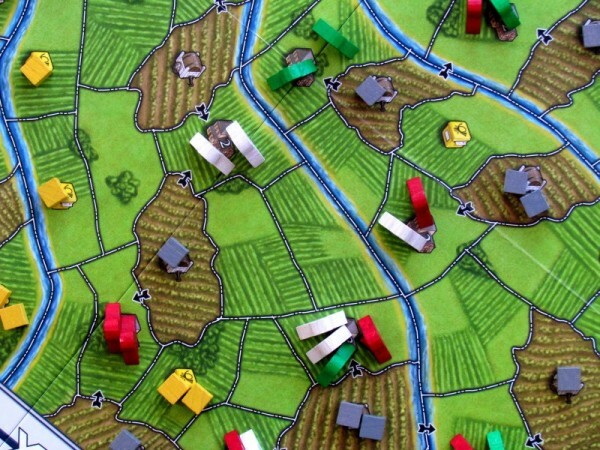 Its author is Martin Wallace and an updated version was published under the auspices of Argentum Verlag (Z-Man Games company for English version) in 2010. Orange box with one English station is winking to all lovers of trains. 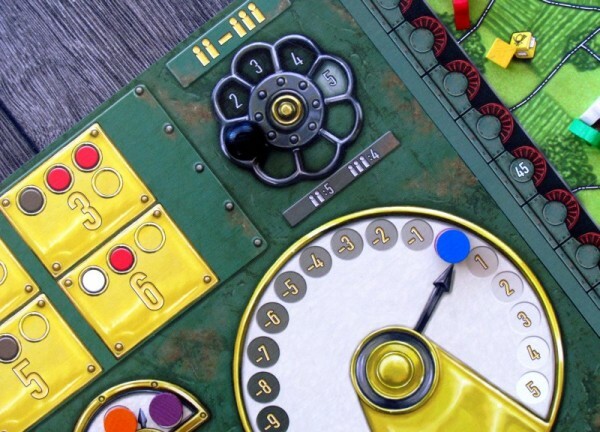 And that is exactly right, because inside the box, it will all revolve around locomotives, tracks and passengers, revealing all possible train goodies. And the most important thing is of course land to build on, given on a folded board. It contains a number of spaces, which are divided by means of white lines. 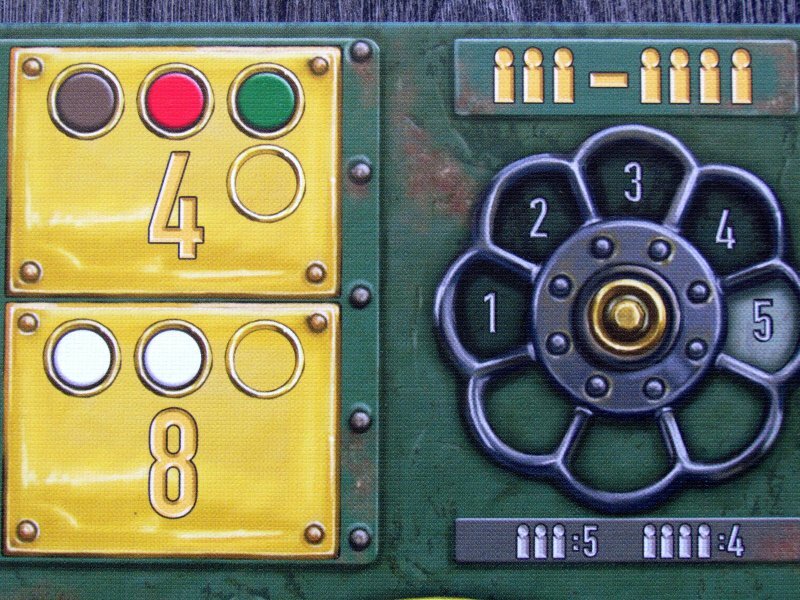 But it has two sides, so you can play not only new Germany version, but also original variant set in England. But that’s not all, even in terms of large cardboard parts. 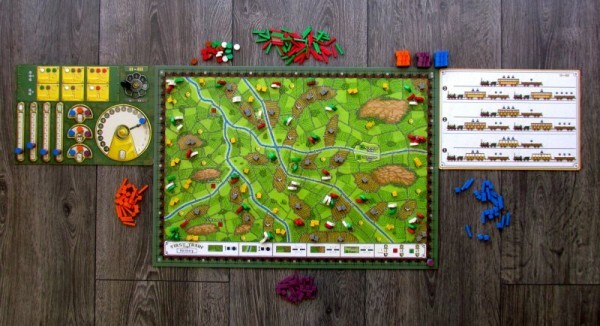 There are two other boards, same dimensions as the box itself, and provide list of available train configurations and then also scales to watch influence and order on common board. Heap of different scales is really there – influence over government, as well as individual companies (green and red), but also more boxes of influence with colorful dots, as well as various indicators of order. In the upper right corner is turn counter. And then there are only rules, a canvas bag used for starting distribution and a plastic bag full of wooden figures, bars, trains, cubes and tokens. At the beginning of the game, each participant chooses one color and takes all the appropriate pieces – trains, tracks, fifteen investment cubes and nine tokens. Three of them are immediately placed on a scale order (building tracks, purchasing and actual order), while four others on scales of influence. All cubes are placed in a canvas bag and two randomly placed on each spot on the board with yellow or brown marks. These places can always produce only one type of goods. So if players drew wrong color for some spots, they must remove it and there will be less resources on that spot in the beginning. All stations are inhabited by some waiting passengers, which are also drawn randomly together with landlords. Game lasts four rounds. Each of them will begin by the players taking their twelve investment cubes from the stock. And before embarking on the auction itself, they first must find out, what will they actually fight for. 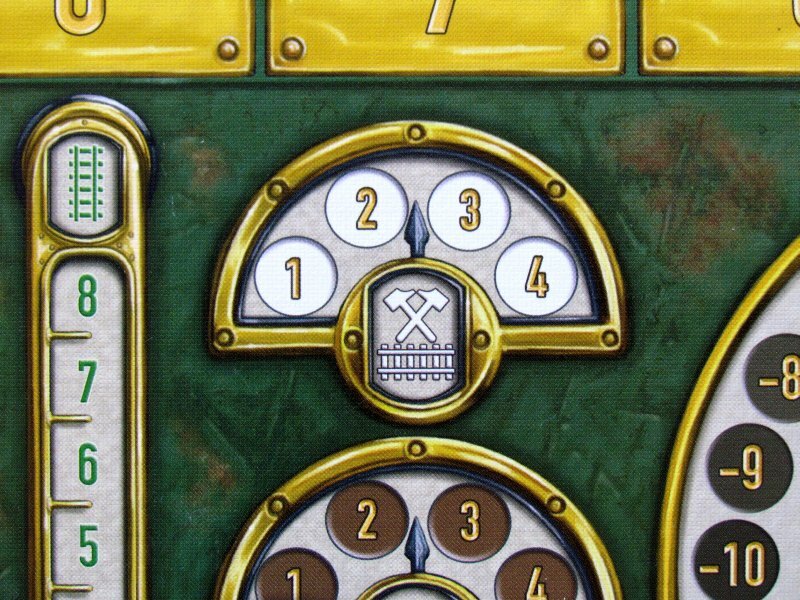 Each of the influence boxes (with some already printed colors) is randomly equipped with one round token. Each player is then bidding on one of these resources available. To do this, any number of cubes can be used. But if he wants to occupy a place, where other player already has his influence, he must pay at least one more cube and return enemy cubes back to him. When all participants have two bets active, the auction ends. 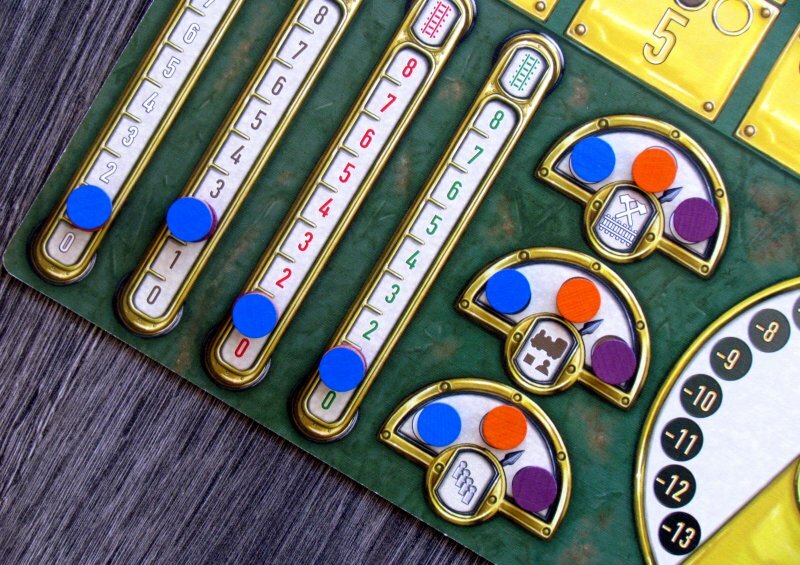 Individual color of dots correspond to four scales of influence, where players can now mark their newly accumulated points by moving up the ladder. Influence on the scales will now determine order of track construction and purchase of machinery. According to that, players have to adjust the order tracks and then they can move into fifth and sixth phase, where these two activities can be finally put into action. 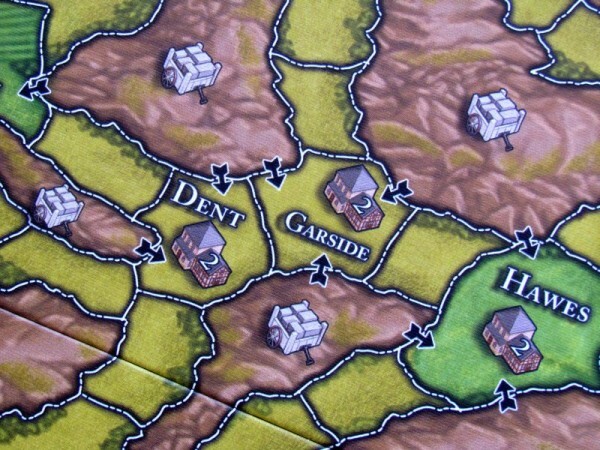 Players can then create (in order) one track to connect some areas and it may never split along the newly created line. Number of tracks themselves, which always crosses one of the borders between two neighboring areas, is unlimited and depends only on the choice of the player (and his ability to pay). Of course, there are costs and they comprise of fees to land owners (pawns) and companies controlling the city (green or red). But also connection of other spaces entails costs and players must pay for these with investments cubes and possible by points of influence (players themselves choose, which color they use to pay). 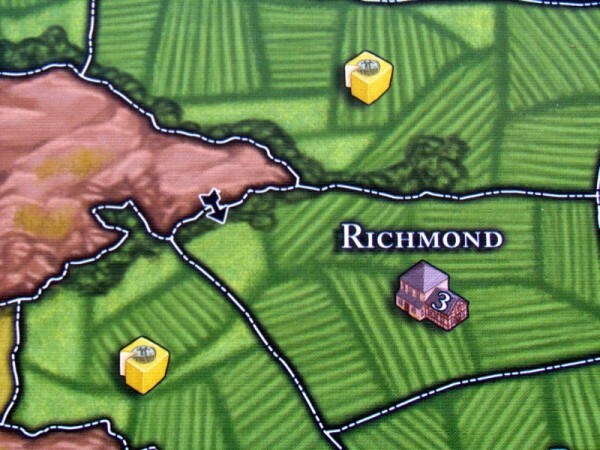 Interconnection of some cities can attribute victory points to player, who completed it. 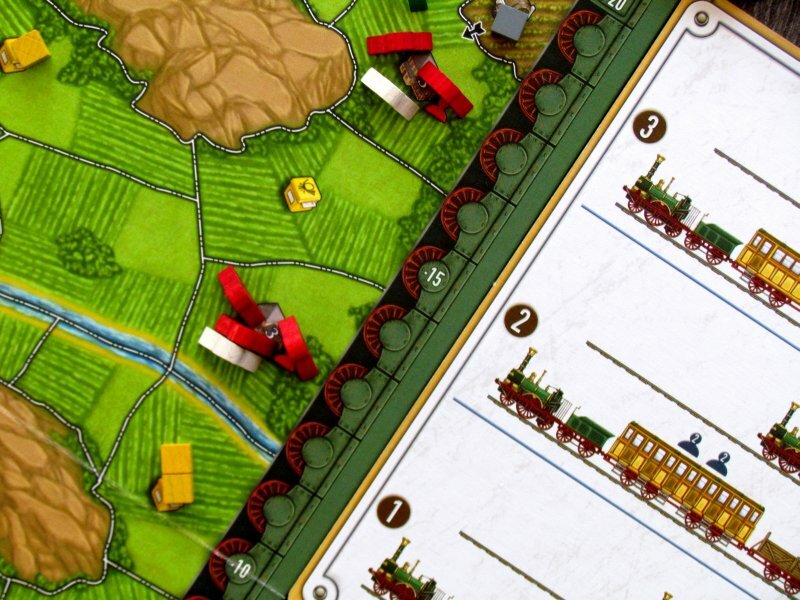 Using the built tracks, players will be able to finally move goods. But to do this, they must first acquire some machines. 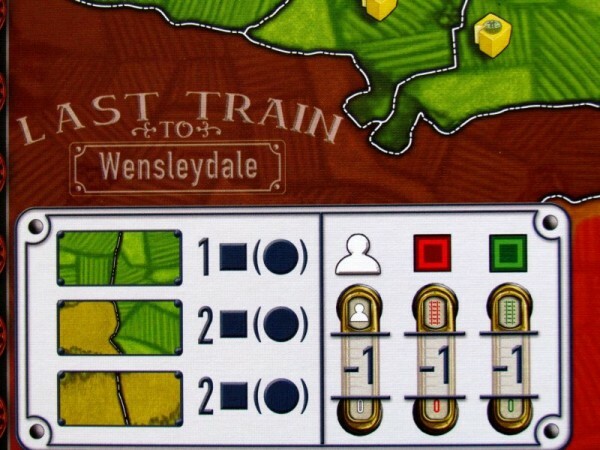 They use influence with the train companies, that can sell to players some older second-hand locomotives. Their price and capacity is shown on the overview board. 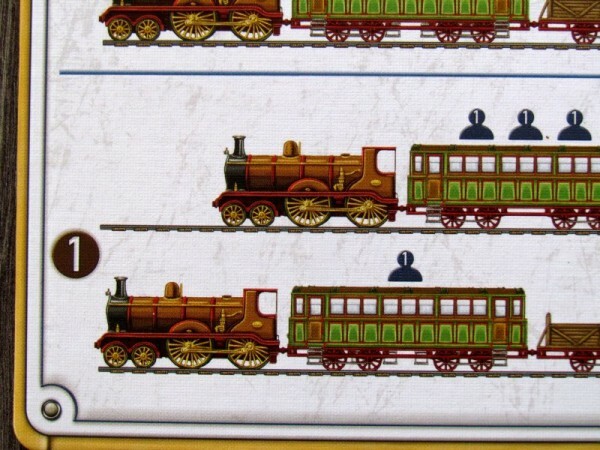 It is possible to transport goods and passengers, but whereas in the first case, you just pick up and delivering is done automatically, so to speak, in case people, player must be able to carry them through with his track from one station to another. Players can load not only from boxes, through which the track leads, but also from neighboring ones. They are awarded one point for each piece after transport. 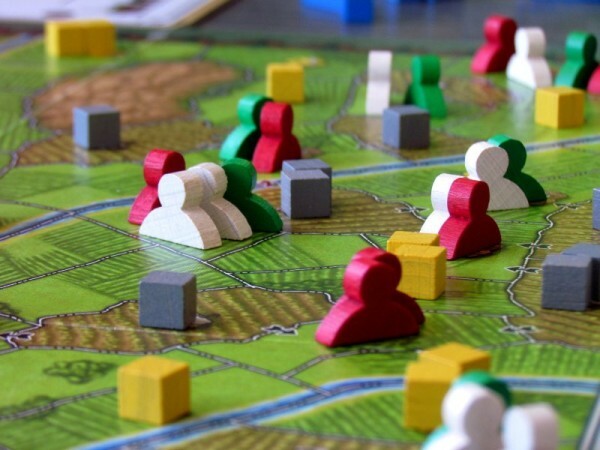 But income will be lowered by one point for each piece of track, that player has in his ownership and must maintain. 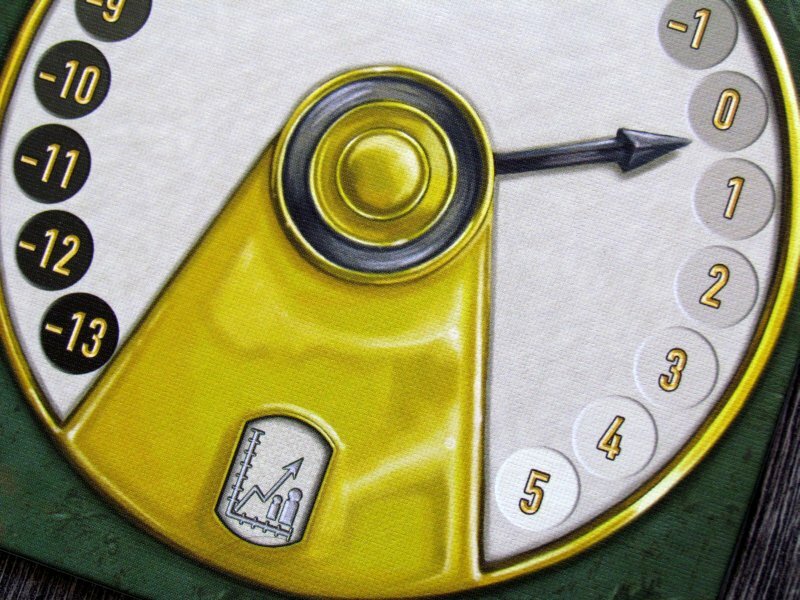 Even before end of the round, players move again their order based on the circle of profits and losses. 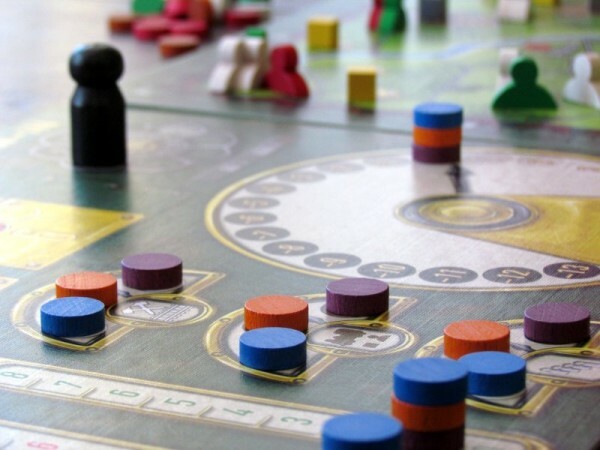 Then, players have the opportunity to reduce their expenses for future rounds by selling some of their tracks to one of possible companies – green or red. They get nothing for it but, instead, must spend influence token of green or red color. 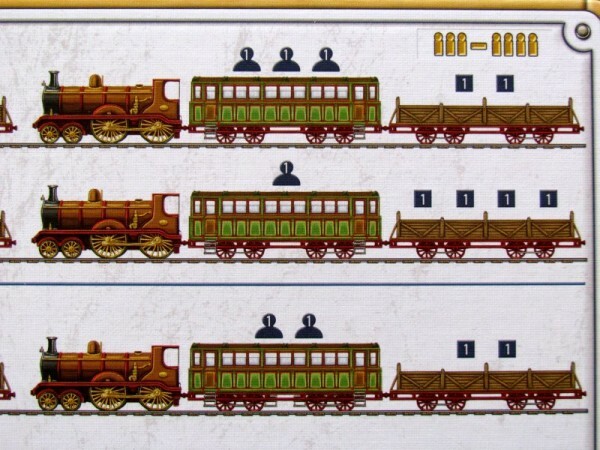 After playing the final round, players get to gained more points for the entire set of goods and passenger colors. But again, they must subtract one point for each track, they have still on board plan in their own color. Only then is it possible to determine the winner as a player with the highest point sum. 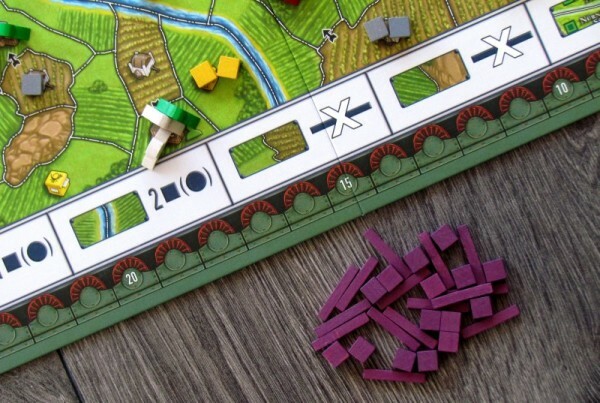 First Train to Nuremberg is a train game, which not so much about the actual locomotives and carriage of stuff. The main center of attraction here is the ownership and operation of tracks with all earnings and costs, that may befall on any firm devoted to this branch. The ingame’s basic currency is influence. Players can use it for various actions. But in addition, there are also investment cubes with which players enter the auction. And those are the only way to accrue that valuable influence. These auctions are simple and do not drag too long. Only then, when all players have their two spaces bought, whether these are the ones they wanted at the beginning or not (and have been forced to choose a different place by rival offer). It was here, where especially in the later rounds is happening a very exciting shootout. Each match is different due to the random distribution of goods and passengers in the beginning. This random draw creaters other conditions every time, and players must adapt structure of their tracks. Finally, these are the main way to earn points, but also to lose them, because cost of their operation are also not negligible. You can compete in transport of goods even in the two and you do not have to worry about that number. Conversely, you get faster game, in which you finish below one hour. This number can in higher number even double. Very interesting option offers three game variant, where players can determine for themself, which side of supply board shall be used. This will affect availability of resources. 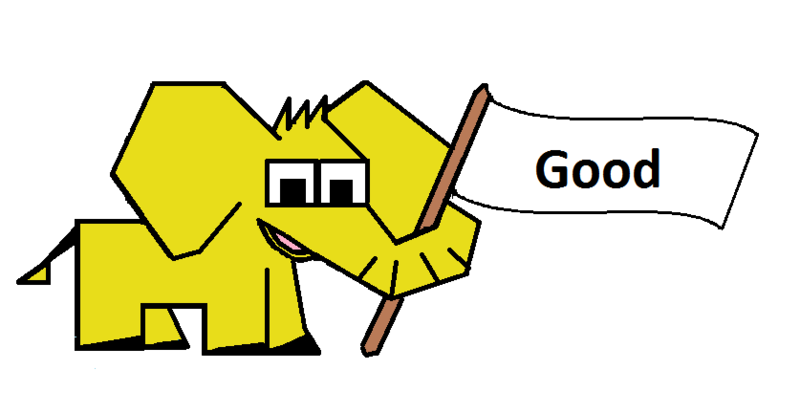 Processing is good. It is well, that the publisher has also prepared a quick overview of the rules, that clearly summarizes all the important information. Rules alone explain everything very extensively and in detail, but maybe that’s the problem. There are not very self-explanatory. 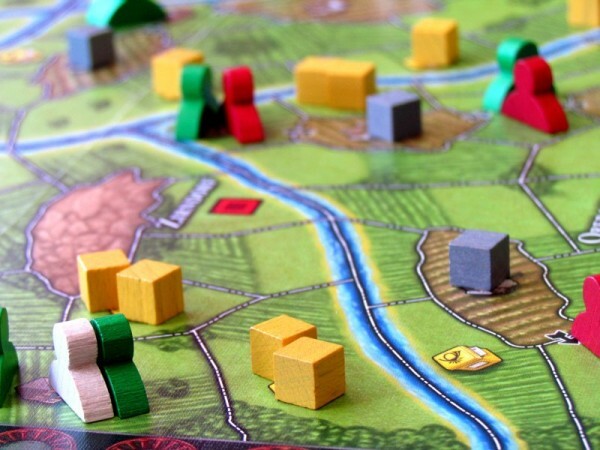 Boards have nice graphics too and two games in one box is very good news to have. 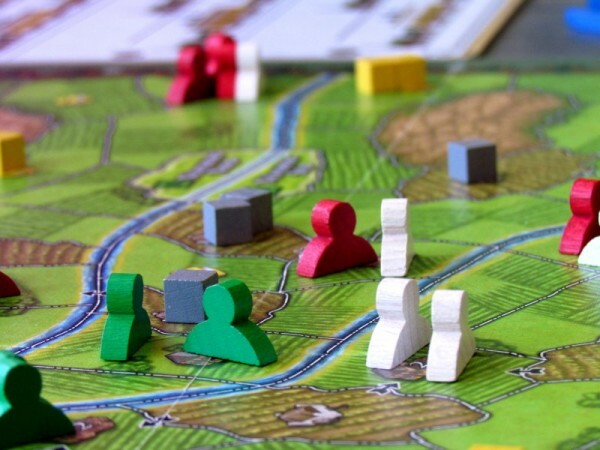 First Train to Nürnberg will not be a game for everyone. It’s very dense, slow and thoughtful game. Theme of connecting areas and having trains here looks promising, but it does not bring the desired atmosphere for everyone. This game is just as dry as a camel tongue. 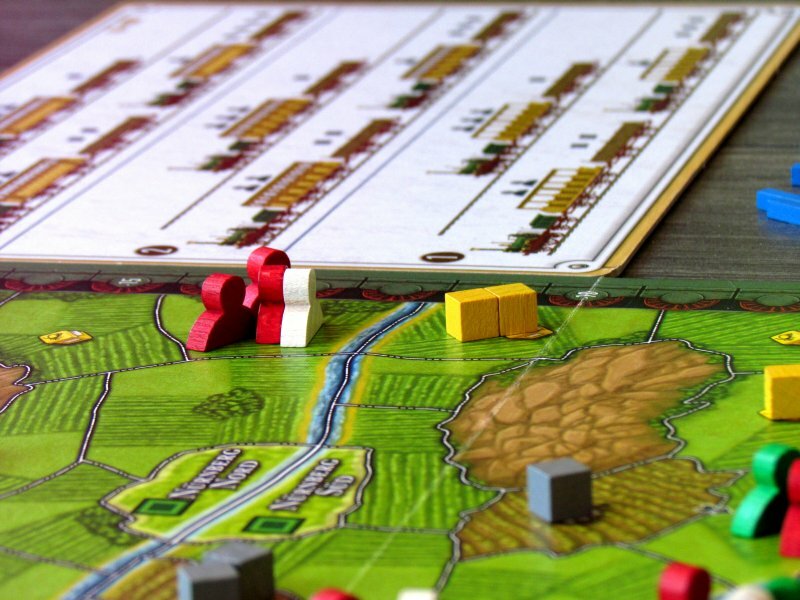 Some gamers will like it, because they appreciate the strategic control and thinking. It’s up to you. 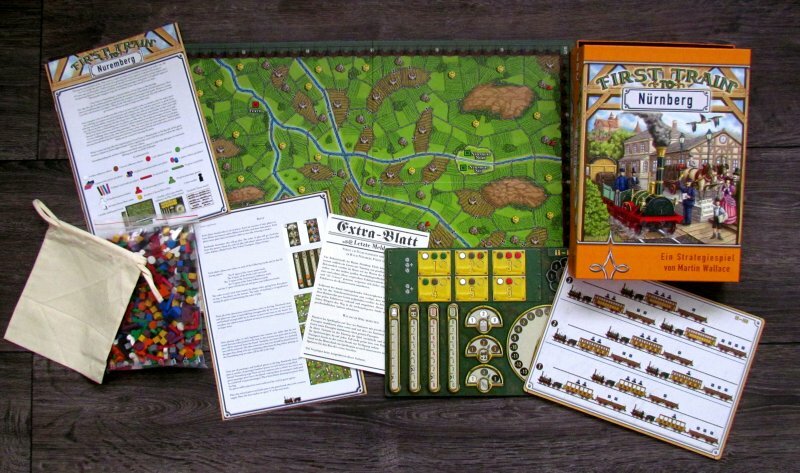 Vydavatel Argentum Verlag, Z-Man Games, Inc.
First Train to Nürnberg offers untraditional train fun. Players build the track between areas and trying to prepare links for subsequent transport. In doing so, they must first of all carefully monitor impact of their resources and remain in profit zone. Costs of running track are not negligible and are reducing profit in each round. 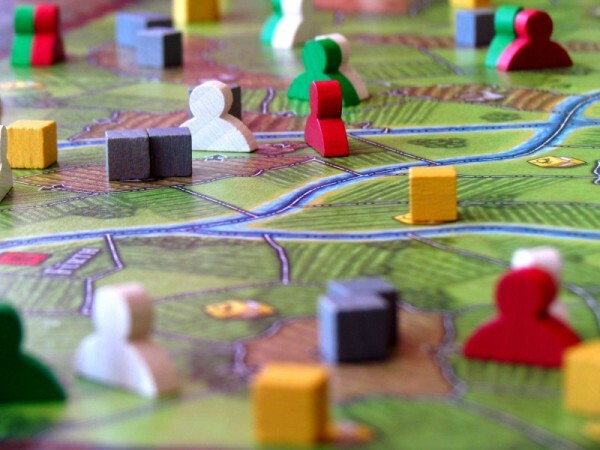 There are plenty of possibilities and thanks to this, game stretches to two hours in a higher number of players. Although the game is very slow and thoughtful, it suits perfectly. This also clearly divides the field of candidates interested in the game. First Train to Nürnberg will definitely find it, because it is a very good entertainment for the right audience. Only, it will not be everyone.